Chadwick Boseman revealed the final photo from the set of Black Panther, with production wrapping today. The image features the actor standing alongside Lupita Nyong'o and writer-director Ryan Coogler, along with a previously-unannounced cast member, Sydelle Noel (G.L.O.W.). While the actress had not been revealed as part of the cast before, she also responded to Chadwick Boseman's tweet, stating that they are "making history," along with the hashtag #ThatsAWrap. While it remains to be seen who she will play, the production wrap now starts the countdown towards the first trailer, which may be coming in a few months. 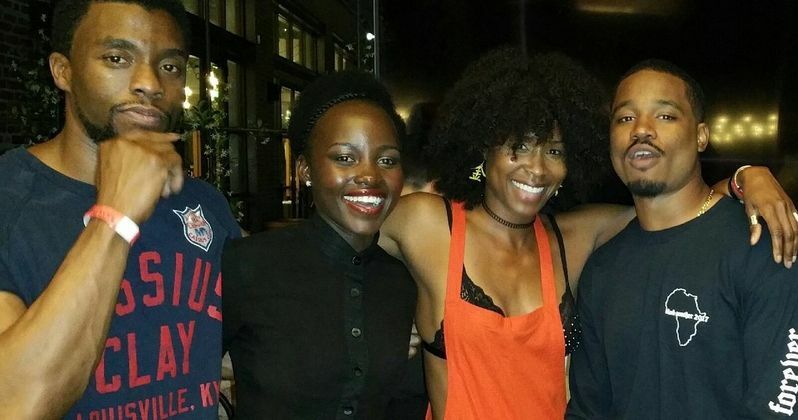 While Sydelle Noel's character has still yet to be confirmed, it's worth noting that she participated in the Get Out Challenge video from the Black Panther set, with Daniel Kaluuya. It's possible that she's playing one of the Dora Miljae warriors, the elite team of all-female bodyguards who protect the king of Wakanda, and are also candidates to become the new Queen as well. It's possible we may find out who Syndelle Noel is playing during Marvel's Comic-Con 2017 presentation, since studio president Kevin Feige recently confirmed that the studio will have a presence at SDCC. While he wouldn't confirm what films will be showcased there, it's completely possible that the filmmakers can cut together a sneak peek of Black Panther in the next three months, to showcase in Hall H. Especially since they already showed off footage earlier this week at a Marvel open house in Burbank. Chadwick Boseman sent the photo out to his Twitter followers earlier this morning. Last month, we saw a few action-packed car chase set videos from the South Korea set near Gwangan Beach, which showed Black Panther in full costume hanging onto the roof of a Lexus LC as it speeds down the street. There was no indication if that was a stunt double hanging onto the car, or if it was actually Chadwick Boseman, and no details about who was driving the car was released. It's possible that Erik Killmonger was driving the car, but that has yet to be confirmed, but it's possible that it could be the villain. Black Panther started production in late January, with the full cast list confirming that John Kani, who played T'challa's father T'chaka in Captain America: Civil War, will return, despite his character being killed in last summer's blockbuster. No details about his return have been given, but it seems likely that there may be some flashback scenes with T'chaka that illustrate his son's upbringing in the fictional African country of Wakanda. The cast also includes Michael B. Jordan as the villainous Erik Killmonger, Lupita Nyong'o and Danai Gurira as Dora Miljae warriors Nakia and Okoye, Martin Freeman reprising his Captain America: Civil War role as Everet Ross, Angela Bassett as T'challa's mother Ramonda, Forest Whitaker as the statesman Zuri, Andy Serkis returning as Ulysses Klaue, Letitia Wright as Serita, who doesn't appear in the comics, Winston Duke as M'baku, a.k.a. Man-Ape Florence Kasumba as Ayo, another member of the Dora Miljae and Sterling K. Brown as N'Jobu, another character who doesn't have roots in the comics. Ryan Coogler, who is coming off the blockbuster Creed, is directing Marvel Studios' Black Panther from a screenplay he co-wrote with Joe Robert Cole who recently was nominated for an Emmy for his work on The People v. O.J. Simpson: American Crime Story. Marvel has set a February 16, 2018 release date for Black Panther, which puts it up against Warner Bros. comedy Game Night. Take a look at the final set photo from Black Panther below.